I pity the world’s best golfers. The greatest fear they have on the golf course is missing the cut or if they’re lucky, tightening up as they get in contention on Sunday. To them, the life of a hacker must look like an extreme sport with enough fear-inducing shots during a round of golf to put it on a list of “must-do” things on a trip to New Zealand. So forget that six-foot putt to win The Open or a sudden-death playoff to win The Masters, we’re all amateurs, weekend hackers and once-a-year golfers ’round here and we have a far more complete, exhilarating and perilous set of golf shots to deal with every week. No matter what the golf shot, if you’re hitting a golf ball in front of a crowd it’s a scary one. It doesn’t even have to be a crowd. Sometimes it is just the sight of the club pro or some bloke walking his dog down the OOB fence that will bring on the sweaty palms. Closely resembling the equally difficult half shot, even the pros prefer not to play this one. Smashing that drive doesn’t seem quite so smart now you’re left with a shot you don’t have a club for. I once played a four-ball ambrose where the ¾ shot yips went through the group like a dodgy Indian curry. In the first four holes we were left with three 60-metre pitch shots and only one of the twelve shots found the green. And even that was hit skinny. A shank comes quickly, you can barely believe what just happened and it takes some courage to face the next shot. 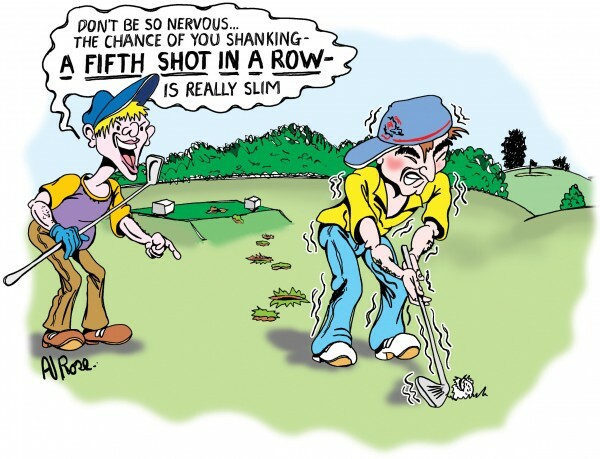 Like a bad case of the sneezes, two, three or four consecutive shanks in a row is not uncommon once they start. I perpetually live in fear of hearing Billy Ray Cyrus’ Achy Breaky Heart song. The shanks are the same. No matter if you’re staring at 40 points or 14, the shot across a water hazard gives everyone the shakes. The approach shot to a green protected by a lake is often followed by blood curdling screams, a stream of abuse, and an airborne golf club. Not quite as daunting as the shot across water, but no less difficult is the chip over a bunker. The odds of thinning or chopping it into the sand get shorter the longer you dwell on it. 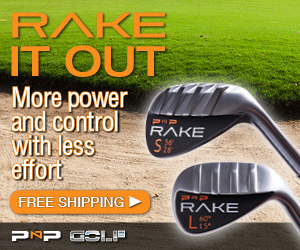 If the thought of stroke play fills you with fear, how about having to hit again from the first tee. If this second one doesn’t go straight, heading back to the clubhouse becomes a real option. Another six inches and this would’ve been a gimme, but now you’re left with a short putt that seems harder to achieve than cancelling your gym membership. The worst part about the three-footer is that even when you make it, the relief doesn’t completely alleviate your nerves and a slight tremor on the next tee is not unusual. This is a tough shot. You’ve had five minutes to think about your shot and your playing partners are anxious to get going. There is no point in hitting until the group in front is well clear, but you look ridiculous when you sky your drive and it finishes no further than a pitching wedge in front of the tee. This shot is as close to driving with a cougar in the car as you’re going to get on the golf course. It is not a golf shot for the feint-hearted and one that most Aussie golfers have experienced at some point. A surreptitious approach to the golf ball proceeds with your eyes and club directed at the angry magpie. Your heart is racing, you slash at the ball and run off with clubs and arms flailing. It is the ultimate shot in extreme golf and if you can pull this one off, even the pros would be impressed.